TINA mid back office helps resolve a whole range of problems that a travel agency may encounter – from the most basic to the most complex. A long term expertise in the travel industry and hundreds of business models analyzed translated into a robust application that today is being successfully deployed in over 25 markets. TINA has the ability to accommodate any business model and to cover any possible scenario that might appear in the daily activity of your agency, regardless of size, business model or market. More than that, due to its vast portfolio, TINA provides the advantage of being compatible with the fiscal regulations in each and every market served. Automate time consuming tasks and processes within the travel agency and optimize the internal workflows. Access and store details about both corporate as well as individual clients – from contact information to profiles. Organize the different aspects of your suppliers – general details, fiscal details, product names, prices from contract, invoicing profiles, commission management, CRM data. Input of all requests (no matter of channel), processing the requests according to the approved workflows and procedures, parallel multiple searches inside 3rd party systems & searching inside own inventory. Generate the travel documents in a variety of formats. Manage documents such as: client invoices & payments, supplier invoices & payments, settlements between client and supplier invoices. TINA allows you to customize your documents. Generate report templates that fit your needs. TINA makes it possible to integrate with accounting software through a feature that enables you to export and import data from the software. 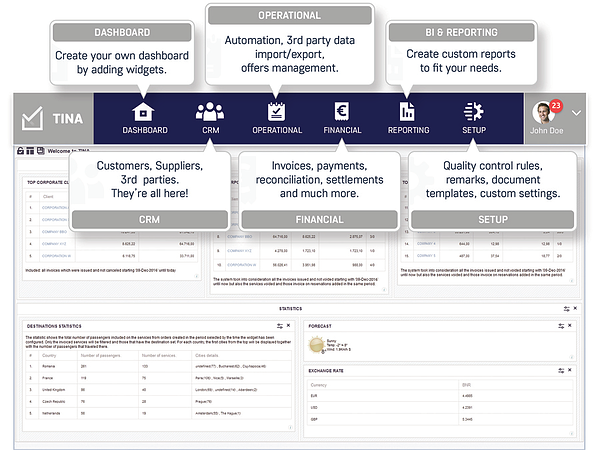 Launch multiple parallel searches in any number of suppliers' systems and import all the data you need into TINA. Find out how TINA software can improve your travel business! “Last year we made a significant decision implementing TINA ERP as our mid Back office for Talma Wholesale ltd. considering the fact that our local market behaves totally different from any other market.